BACKGROUND: Composition of renal stones influences management of patients with renal stone disease. Currently stone composition can only be analysed ex vivo after stone extraction or passage, but recent introduction of dual-energy computed tomography (CT) to clinical practice has raised interest in the ability of this technology to determine composition of renal stones in vivo. OBJECTIVES: To determine renal stone composition in patients using single-source dual-energy rapid-peak kilovolt (kVp) switching CT. METHOD: Nineteen patients with renal stones for percutaneous nephrolithotomy were evaluated with single-source dual-energy computed tomography on a Discovery CT 750HD. 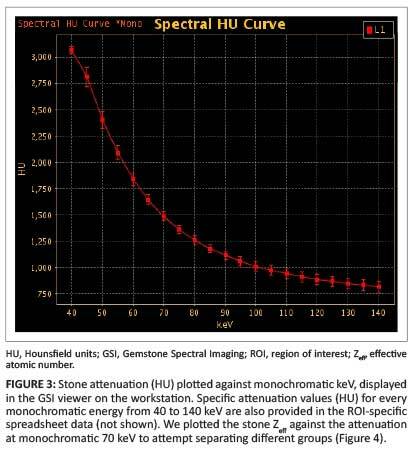 The Gemstone Spectral Imaging (GSI) effective atomic number (Zeff) and attenuation at 70 keV monochromatic energy were used to predict the stone composition. Infrared spectroscopy and x-ray diffraction of stones after extraction served as the reference standard. RESULTS: Two (10.5%) of the 19 stones had uric acid as major component. The other 17 (89.5%) were calcium-based stones. No statistically significant difference between the GSI Zeff and calculated effective atomic number (Z) for stone compounds was found. The GSI Zeff and attenuation could differentiate between uric acid and non-uric acid stones. No differentiation between different calcium stones could be made. CONCLUSION: Uric acid and non-uric acid renal stones can be differentiated with single-source dual-energy in vivo. The GSI Zeff reflects the dominant material in polycrystalline stones. 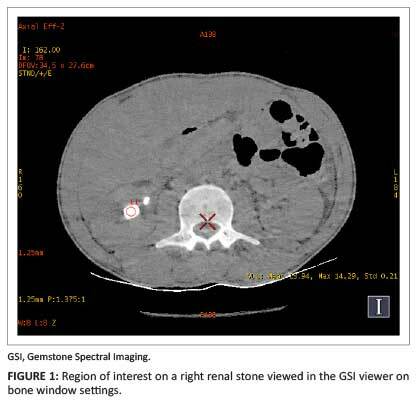 A prospective, descriptive clinical study involving the pre-operative in vivo assessment of stone composition with dual-energy CT was conducted. All stones were renal in origin. The findings were compared to ex vivo laboratory stone analysis after stone extraction via PCNL. The study was conducted in the Universitas Academic Hospital Bloemfontein at the Faculty of Health Sciences of the University of the Free State (UFS).The research protocol was approved by the Ethics Committee of the Faculty of Health Sciences, UFS, and written informed consent was obtained from all participants. The study population consisted of patients booked for PCNL from January 2011 to November 2013. These patients were all diagnosed with renal stones prior to admission, but due to a long waiting list for PCNL, a repeat non-contrast renal stone CT was performed for pre-operative planning and evaluation of disease progression. The standard non-contrast renal stone CT protocol consists of scanning from the top of the kidneys to the bottom of the bladder with 0.625 mm slice thickness and 3 mm image reconstructions in axial, sagittal and coronal planes. Once the renal stone was identified, a targeted dual-energy CT with limited field of view was performed covering the stone area. The CT examinations were performed using a 64 multidetector CT single-source with fast kVp switching (Discovery CT 750HD, GE Healthcare, Milwaukee, Wisconsin). The dual-energy protocol used was Gemstone Spectral Imaging (GSI) with rotation time 0.6 s; pitch 1.375:1; detector width 20 mm; and slice thickness 1.25 mm. Milliampere was set automatically at 640 mA distributed between 80 and 140 kVp acquisitions. GSI is a feature unique to this specific scanner. Dual-energy data were processed by the GSI general protocol on the CT workstation (Advantage Windows, version 4.5; GE Healthcare). A region of interest (ROI) was applied over the renal stone viewed on the bone window settings (Figure 1) occupying approximately 50% of the stone area on axial images. 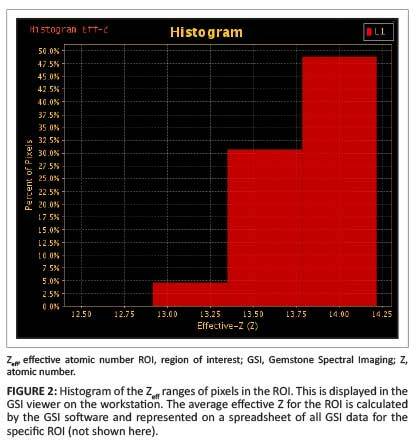 The GSI effective Z (GSI Zeff) represents the calculated effective atomic number of the ROI area and forms part of the standard dual-energy ROI data calculated by the GSI software (Figure 2). Attenuation of the ROI area at monochromatic energy 70 keV also forms part of the vendor-specific GSI ROI data (Figure 3). Both these values were obtained from the GSI data exported to a standard spreadsheet. The stones extracted via PCNL were sent for analysis to the local National Health Laboratory Service (NHLS) laboratory. Stone composition was determined using infrared spectroscopy and x-ray diffraction. The Zeff value according to stone composition analysis (Calc Zeff) was calculated using Mayneord's equation14 and then used as the standard against which to compare the GSI Zeff. Statistical analysis was performed using SAS/STAT statistical analysis software and Microsoft Excel. Two different strategies were used to evaluate the accuracy of determination of renal stone composition. Firstly, we wanted to determine whether the GSI Zeff for each stone was similar to the Calc Zeff. The GSI Zeff was subtracted from the Calc Zeff for each stone to determine the difference (diff_Z), and the median diff_Z for all stones was calculated to determine whether the difference between the GSI Zeff and Calc Zeff was statistically significant. Secondly, we plotted the GSI Zeff against the attenuation (HU) at 70 keV for each stone group to determine whether there was good separation between the groups based on the GSI Zeff. Twenty-five patients were included in the study. Six patients had to be excluded due to PCNL cancellations or insufficient extracted stone fragments for laboratory analysis. Thus only 19 patients with confirmed ex vivo renal-stone analysis results were included in the study. The patients' ages ranged from 19 years to 66 years, with a mean age of 45 years. Eleven (57.9%) patients were male. The laboratory stone compositions, GSI Zeff, calculated Zeff and attenuation (HU) at 70 keV are listed in Table 1. The median diff_Z was 0.82, although the difference between the GSI Zeff value and calculated Zeff value was not statistically significant, with a 95% confidence interval (CI) of [-0.28; 1.54]. 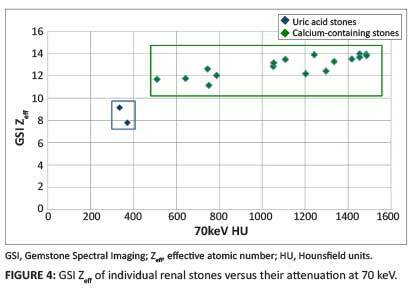 The scatter plot of the GSI Zeff of the individual renal stones versus their attenuation at 70 keV demonstrates that uric acid separation from the calcium-containing stones was graphically possible (Figure 4). Both stones with a predominant uric acid component fell below a GSI Zeff of 10 and an attenuation of 400 HU at 70 keV. Knowledge of the chemical composition of urinary tract stones is essential for planning the management of patients.8 Dual-energy CT is an emerging application for possible in vivo characterisation of renal stones, although data on the subject are limited at this stage. This was the first study on in vivo renal stone characterisation done in South Africa using the single-source, dual-energy system by GE Healthcare. Our results indicate that the GSI Zeff measurement can differentiate between uric acid and non-uric acid stones, which was in keeping with the findings of a recent study by Kulkarni et al. on a machine with the same specifications.10 As found in previous in vivo studies,10,13 we could not accurately differentiate between the different subtypes of calcium stones. In our small study of 19 patients, only two patients had stones with uric acid as major component; the other 17 had calcium-based stones. As we did not encounter any stones of the cystine or struvite group, we could not provide data on the differentiation of these stones from other stone groups. The polycrystalline composition of our calcium-based stone group complicated the differentiation of stone compositions, which was demonstrated by the inability to separate clearly different stone compositions from one another on the scatter plot (Figure 4). Only three (15.8%) of the 19 stones were pure. The single pure calcium oxalate monohydrate (COM) stone had a mean GSI Zeff of 13.16, which was very similar to the in vitro (13.21) and in vivo (13.86) results obtained by Kulkarni et al.10 in the only published study using similar technology in vivo. Their study did not contain carbonite apatite stones10 and therefore no comparison could be made to this stone type. The lack of a statistically significant difference between the GSI Zeff and calculated Zeff for stone groups in our study, and the similarity in GSI Zeff results to other studies using similar technology,10,12 support GSI Zeff accuracy for possible renal stone composition determination in future. It should be noted, however, that no clinically acceptable margins of error have been proposed for Zeff values due to the small number of in vivo studies on limited stones. In our study, the measured GSI Zeff values ranged between 7.78 and 13.98 (11.13 and 13.98 when excluding uric acid-containing stones). This small difference (2.85) in GSI Zeff values is likely to make stone differentiation of non-uric acid polycrystalline stones very difficult in the clinical setting, where pure stones appear to be minimal. The polycrystalline stones differ slightly regarding their effective atomic number and any combination of stone constituents can result in a given Zeff value. Large stones are surgically managed by stone fragmentation using shock wave lithotripsy or alternatively by ureteroscopy or PCNL.5,11 El-Assmy et al.8 demonstrated that high CT attenuation (> 1000 HU) of a stone is a significant predictor of failure to fragment renal stones by shock wave lithotripsy. Future studies on dual-energy monochromatic attenuation values or GSI Zeff values as predictors of failure to fragment renal stones may be of value to refine treatment algorithms. There were a number of limiting factors in the study. Only a small number of stones were included due to the limited patient cohort. We did not evaluate the effect of stone and patient size on attenuation values, as this was not our primary research question. No stones of cystine or struvite composition were encountered in our study population. Due to insufficient stone fragments for laboratory analysis and PCNL cancellations, six patients had to be excluded from the study. Continued in vivo studies on dual-energy CT renal stone characterisation with larger stone numbers are needed to attempt better differentiation of calcium-based stones and refinement of dual-energy CT protocols. Single-source dual-energy CT with GSI in the study accurately distinguished between uric acid and non-uric acid renal stones, but failed to subclassify calcium-based non-uric acid stones. Mixed uric acid and non-uric acid stones demonstrate characteristics of the dominant component. The effective atomic number of renal stones determined by means of dual-energy CT shows no significant difference to the calculated effective number using the laboratory stone composition. Despite limited stone numbers, effective atomic number calculation with dual-energy CT shows promise in determination of renal stone composition. The authors acknowledge the personnel of the Department of Urology and the radiographers at Universitas Academic Hospital for assistance; the personnel of the Unit for Interventional Radiology for extraction of the renal stones; Mr Cornel van Rooyen, Department of Biostatistics, Faculty of Health Sciences, University of the Free State, for statistical analysis of data; and Dr Daleen Struwig, medical writer, Faculty of Health Sciences, University of the Free State, for technical and editorial preparation of the manuscript. The authors declare that they have no financial or personal relationship(s) that may have inappropriately influenced them in writing this article. The authors are not employees of GE Healthcare and no funding was received from GE Healthcare for the study. J.H.C. (University of the Free State) was the principal investigator and wrote the manuscript. W.S.H. (University of the Free State) made conceptual contributions and was involved with manuscript editing.